In 1917 Samuel Schwarz, a Polish-Jewish mining engineer, discovered a rem­nant crypto-Jewish community in Belmonte, the Tras-os-Montes region of the Beira Alta, in central Portugal along the border with Spain. Eventually two crypto-Jewish communities with somewhat different practices came to light. The judeus around Belmonte and Covilha abstained from pork only on Saturday, al­though they avoided at all times rabbit, fish without scales, and anything made with blood. They lit Sabbath candles inside clay pitchers. Preceding mass they would mumble a prayer expressing their disbelief in bread (the host) and stone (Church images). Jewish holidays were celebrated late to avert scrutiny. Their reli­gious services were generally led by women. In the Braganza region and Carcao the judeus did not distinguish between clean and unclean animals. Their men and women prayed separately, generally in services held in the open air away from town. They set their festival calendars by the new moon and celebrated the major life-cycle events both at church and at home. Both groups gave more atten­tion to fasting than to feasting, and both groups preserved a large number of prayers, including scraps of Hebrew (Caro Baroja 1961, 3:230-3). 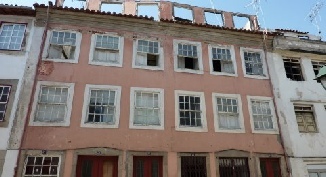 The discovery attracted wide attention in the Portuguese and Jewish press, and in the following years many members of the Belmonte community were re-introduced to norma­tive Jewish practices, sometimes with Ashkenazi rather than Iberian Sephardi models. HOW HAS A SMALL COMMUNITY RETAINED ITS GENETIC IDENTITY? Portugal - A genetic analysis of northern Portuguese crypto-Jews recently yielded a mysterious discovery: It exposed an isolated Jewish community that has somehow retained its genetic identity for centuries - while avoiding the inbreeding that usually occurs in such situations. Now scientists are trying to understand how these Jews managed to bypass a condition which worries most small, closed Jewish communities in the world. The new study by researchers from Porto and Coimbra Universities showed that Jews from the Braganza area are genetically closer to Middle Eastern Jews than to the surrounding Portuguese - even after living there for 500 years. This emerged from an analysis of the Y chromosome, which is passed exclusively from father to son with negligent recombination. This genetic match was observed also in the Jews of Belmonte, a small town situated some 200 kilometres south of Braganza. However, the genetic analysis of Belmonte Jews showed a dramatic drop in genetic diversity, indicative of inbreeding. This is normal for isolated communities, simply because less genetic material is introduced each generation. "All small-sized gene pools tend to lose diversity, but the communities from the Braganza area have succeeded in maintaining a very high diversity, with a relatively small non-Jewish introgression," said Professor Antonio Amorim, a geneticist from the University of Porto who performed the research. The recently published research by Amorim's team of scientists characterized examined the paternal lineages of 57 unrelated males of established Jewish origins from around Braganza. The community there is estimated at a few hundred people at most. A high lineage diversity was found, at both haplotype and haplogroup levels (98.74 and 82.83%, respectively), demonstrating the absence of a strong genetic drift, the research said. It was the first time that the genetic makeup of northern Portuguese Jews had been analyzed. "The results of surprised me," Amorim told Haaretz of his team's study, which appeared a few weeks ago in the American Journal of Physical Anthropology. "My surprise is two-fold," he added, referring to both the low level of inbreeding and to the retention of Jewish genes. "These results can only be explained assuming that the effective size of the population is much greater that it would seem at the first sight," Amorim concluded, "and/or that there is a reproductive strategy minimizing the loss of male lineages but not avoiding totally the input of non-Jewish males." The team of researchers said that "a deeper and more detailed investigation is required to clarify how these communities avoided the expected inbreeding caused by over four centuries of religious repression." They are still waiting for the analyses on the maternal lineages, Amorim said. Jews have resided in the rugged and isolated towns around Braganza since 1187, but most settled there after the 1492 Decree of Expulsion from Spain during the Spanish Inquisition. Jews were allowed to stay in Portugal if they converted to Christianity, but whole communities continued to practice in secret, becoming crypto-Jews. The people studied in the research belonged to such families. on the launch of the book," he said. 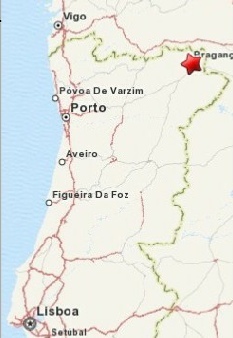 Jews from the Braganza area are genetically closer to Middle Eastern Jews than to the surrounding Portuguese - even after living there for 500 years. 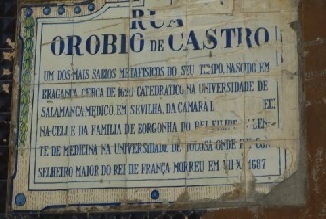 From 1925 the Jewish community in Bragança revived. a Jewish philosopher, physician and apologist, born at Bragança, Portugal.